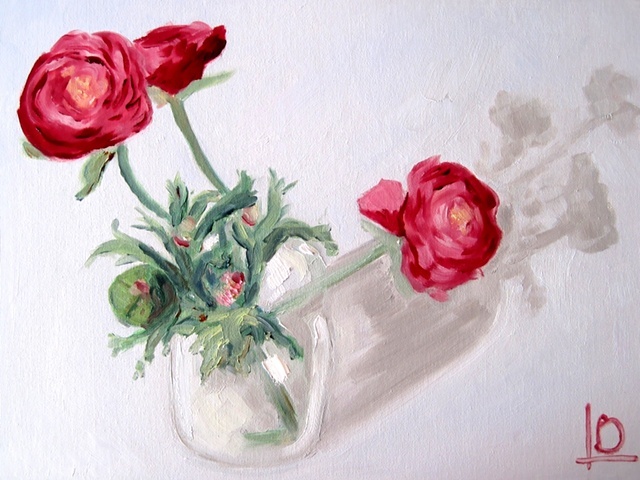 Ranunculus are my very favourite flowers... they're related to buttercups, and remind me of the 'do you like' game. You remember holding a buttercup under your chin, and seeing if you like butter, when the yellow reflected on your skin... well with these flowers we find out that I do infact like reds and pinks! This is the first, in what will be a series of paintings, using these beautiful blooms. The background is a Wedgewood blue, which compliments the deep crimson and pale pinks of the flowers wonderfully.